Police have spoken to Barnsley manager Daniel Stendel after allegations he was assaulted by Fleetwood counterpart Joey Barton. Sportsmail understands that the German met officers at Oakwell on Monday. Discussions are said to have lasted for more than an hour. 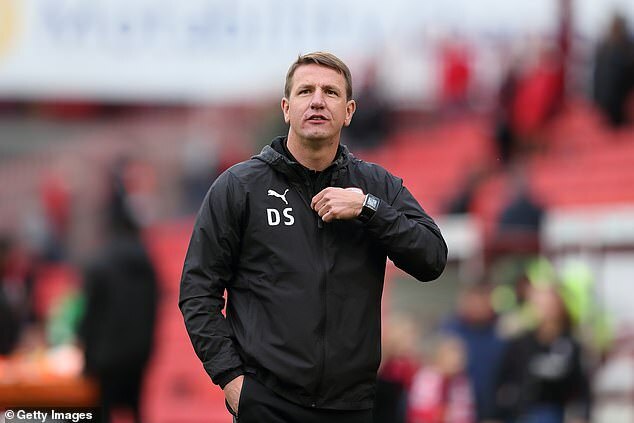 South Yorkshire Police said on Monday afternoon in a statement that their investigation is ongoing – but it can be revealed they have spoken to Barnsley’s 45–year-old boss. 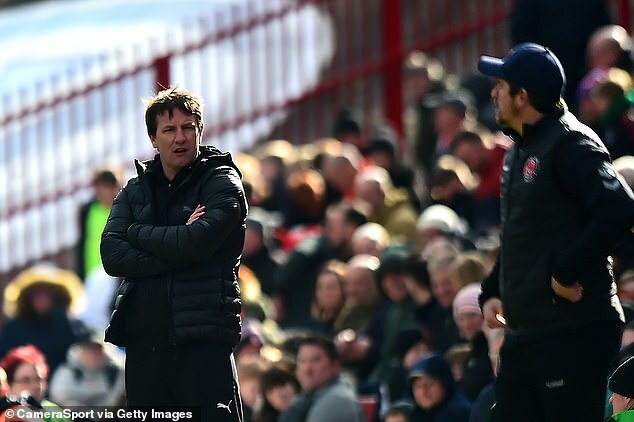 Stendel underwent emergency dental work after claims he was barged from behind by Barton in the tunnel at the end of Saturday’s clash between the two sides at Barnsley. Insiders have said Stendel subsequently banged head first into a metal support at the side of the tunnel, damaging two front teeth. The Football Association have now received the referee’s report and that it does make reference to the alleged tunnel fracas. They will now seek statements from those involved having launched their own investigation, but the police’s probe will be given priority. 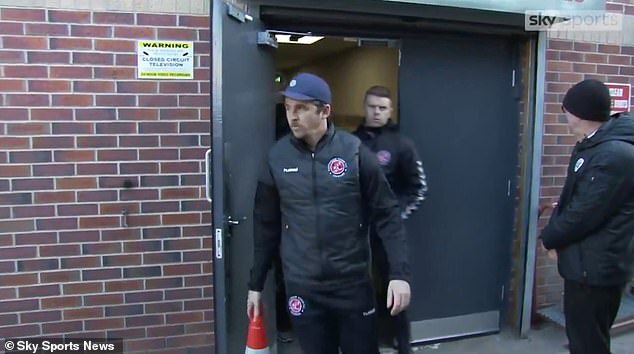 After the alleged fracas, Barton, 37, was caught up in more controversy when a woman police officer prevented his car, driven by Fleetwood chief executive Steve Curwood, from leaving the ground. The car was allowed to continue after a two-minute stand-off. 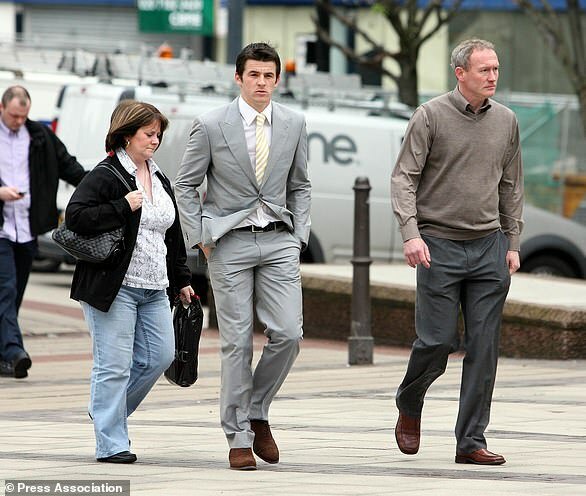 Barton was not interviewed immediately by police, who had not questioned the Fleetwood manager by Sunday afternoon. A spokesman for South Yorkshire Police said: ‘South Yorkshire Police is continuing to investigate reports of an assault at Barnsley Football Club on the afternoon of Saturday April 13. 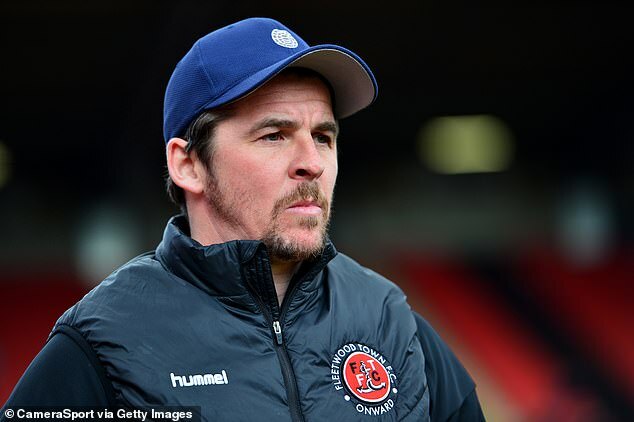 It could spell trouble for Barton, who took over at Fleetwood after serving 13 months of an 18-month ban from football for gambling breaches. The altercation was caught on camera, although not by Fleetwood’s documentary makers, who are following Barton during his debut season in management. Fleetwood’s hand could be forced should the FA come down hard on Barton. It is understood the incident occurred with the majority of players still out on the pitch following full-time. 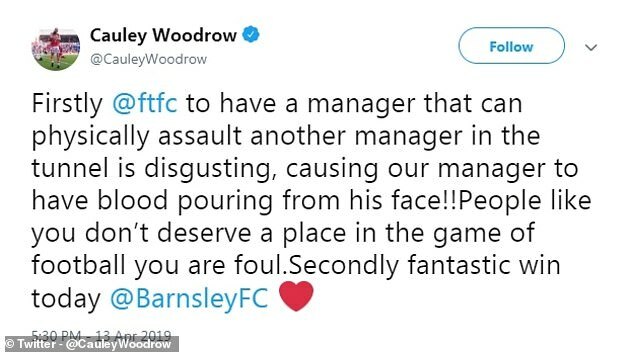 The atmosphere inside Barnsley’s tunnel was described as ‘volatile’ after the alleged assault. Outgoing EFL chief executive Shaun Harvey promised that his organisation will assist in an investigation. ‘As an off-the-field matter the tunnel is in the domain of the referee, but we will work with everybody to ensure it’s not a case of who deals with the matter but that the matter is dealt with properly,’ Harvey told the BBC. Fleetwood issued a brief statement on Sunday morning which said that the club ‘…are currently establishing the facts and will not make any further comment at this time’. 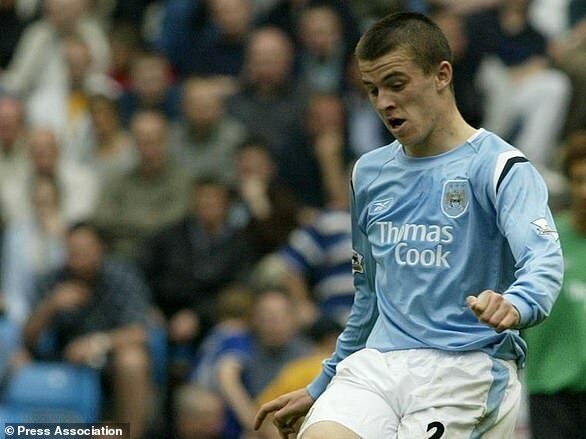 December 2004 – Stubs lit cigar in the eye of young team-mate Jamie Tandy during Manchester City’s Christmas party. Fined six weeks’ wages by the club. Forced to pay four weeks’ salary – approximately £60,000 – immediately, with a further two weeks suspended for a year. Tandy later sued Barton, winning £65,000 in damages. 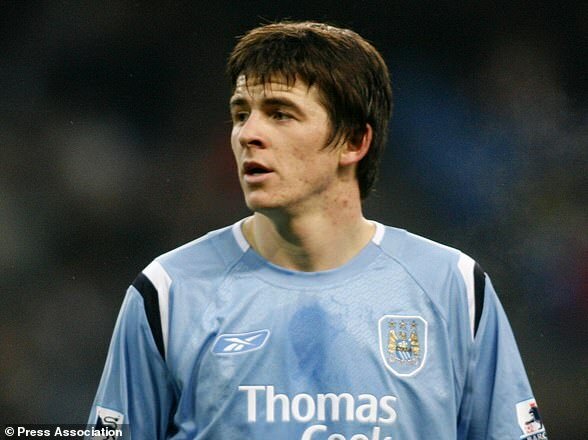 July 2005 – Involved in altercation with a 15-year-old Everton fan at City’s team hotel in Bangkok during a pre-season tour. Fined eight weeks’ wages by City after being found guilty of gross misconduct. September 2006 – Drops his shorts in the direction of Everton fans following City’s 1-1 draw at Goodison Park. 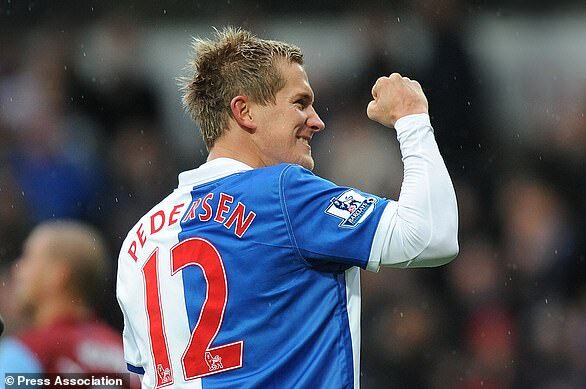 November 2010 – Punches Blackburn winger Morten Gamst Pedersen during a 2-1 defeat for Newcastle at St James’ Park. January 2012 – Unleashes an online tirade against the Football Association, labelling it an ‘Orwellian organisation’ in need of a ‘drastic shake-up’. 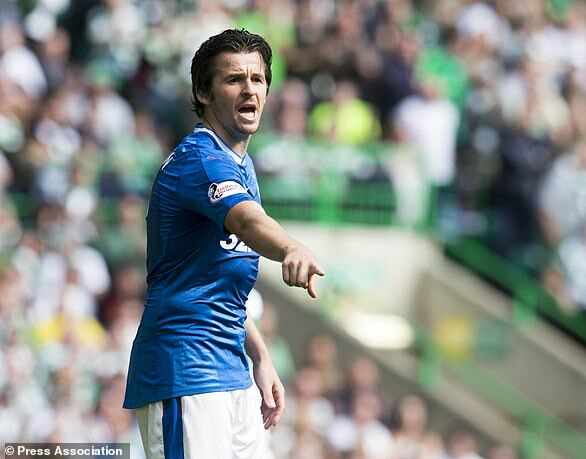 September 2016 – Now a Rangers player, Barton is banished from the club’s training ground following an alleged altercation with team-mate Andy Halliday.